Complete turn-key climate controlled wine features. These are some projects completed by Lunstroth over the years. Some are with NCV and some before he formed NCV. Our client wanted to turn her under-used, old school home office into a feature that enhanced the home, her enjoyment of her wines and a place for conversation. The custom racking includes cabinets, drawers, storage using black iron rods and more custom features. NCV handled the complete project including all design work, all construction tasks and the completion of the room. This is a true below grade cellar inside the Loop in Houston. The climate controlled wine area is next to a small dining area. The racks are in an "E" shape, facing the glass wall. There is a reveal row in all the walls and it follows the curves. The waterfall in the center terminates at a stone counter top. 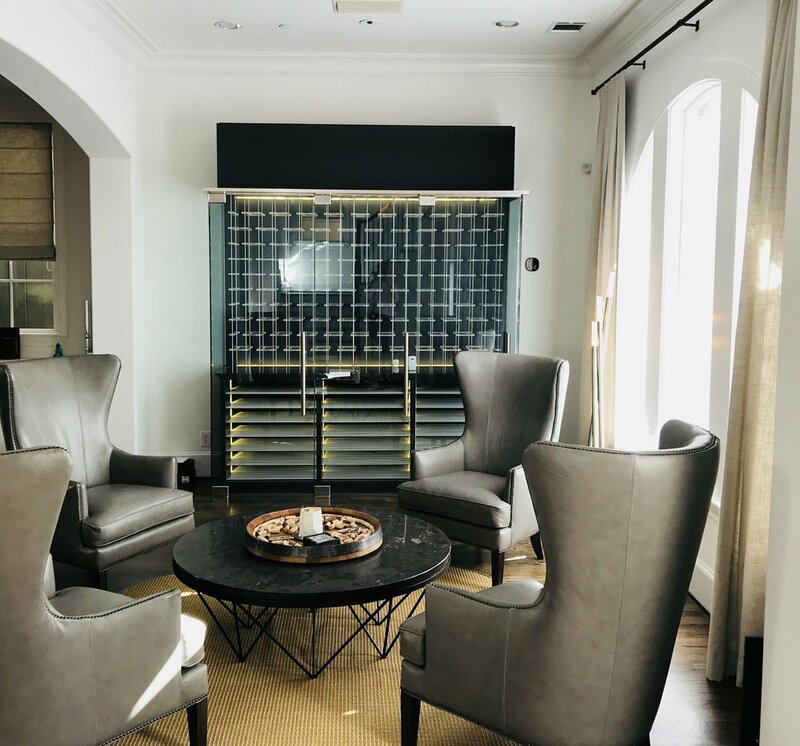 Lunstroth developed the design and was responsible for the complete wine room, working closely with the client, builder and decorator as needed. This custom wine feature, in the gallery of a home on Lake Travis, won the National Award in the 2006 / 2007 Sub Zero Wolf Design Competition. It is three areas along the wall of the gallery. The two outside areas each contain two large Sub Zero wine refrigerators along with custom wood racking. The inside area contains a counter top made from small pieces of colored glass, a scene painted on the wall and custom wood racking. The racks in the center section are supported with iron beams. Lunstroth developed the concept and design and was responsible for the complete job, working closely with the client and installers. The client wanted a climate controlled wine feature to both store some of his large collection in his partially completed new townhome. We turned a nondescript window that looked at the fence into a custom wine feature storing around 250 bottles. The refrigeration is hidden but accessible for service. NCV developed the design and was responsible for the complete wine room, including the glass. This wine feature is part of the casita that the homeowner added to their home outside of Austin. The wine room includes a variety of racking styles and a custom wood ladder. Floor to ceiling wood columns were used to break up the long wall of racks. This wine feature was built in a new home in Houston. It is aluminium pins installed on Oak walls that are stained black. The far wall, the one without wine bottles, slopes along the slope of the stairs. The refrigeration equipment is installed in the lower area of this wall. Strips of aluminum were installed between the pieces of oak in the sloping wall to mimic the pins. This room is in a home designed by Janet Gust, ASID. The feature is part of the bar and visible from the den. It was impossible to get a picture without the reflection. NCV developed the design and was responsible for the complete wine room including the glass, working closely with the client. The client had us build two climate controlled wine features in the very old home that they gutted and remodeled. The interior of the home is traditional and subtle with every detail perfectly executed. This upstairs wine feature was designed to both stand-out and blend in. We worked closely with the builder on things like having trim around the feature that is the same size and color of the crown molding. The interior of the feature is dark gray. NCV worked closely with the client and decorator on the design, was responsible for the complete wine room, working closely with the client, builder and decorator as needed. Laurenzo's needed a wine feature to properly store and display their wines and there was no readily available space. The team worked together to find a place in the dining room that met all the requirements and found it along the wall going to the restrooms. It is visible from the dining room, stores the necessary bottles of wine at the proper temperature and is very functional. Racks: Reserve Wine Rack system from diamond life. Lunstroth developed the design and was responsible for the complete wine feature, working closely with the client and builder. This wine room is a "L" shape with three special features requested by the client. One is the double rows of reveals. Another is the display area at the end of the long section of racks that displays a custom wine box that was a gift from a vineyard owner. The third request was for a focal point, an arch. 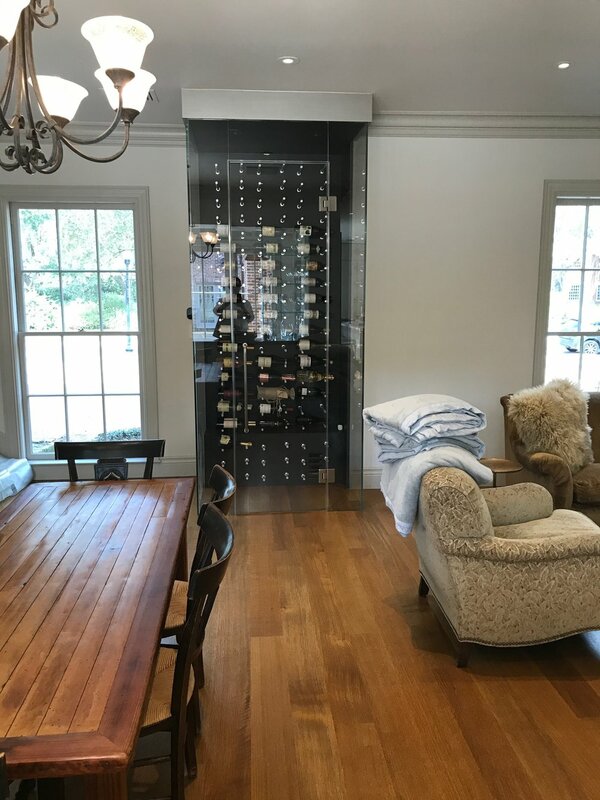 This small but very cool wine feature provide climate controlled wine storage, is visually interesting within the house and acts as a divider between the dining room and kitchen. It was complicated because we wanted the refrigeration equipment to be invisible so we had to figure out a way to install it in the kitchen cabinet. NCV developed the design and was responsible for the complete wine room, including the glass, working closely with the client, builder and decorator as needed.